Natural gas utilities received 12.3 billion cubic metres of total marketable gas in October, up 2.7% from the same month in 2014 and the seventh consecutive year-over-year increase. Gas utilities sold 6.2 billion cubic metres of natural gas in October, up 3.2%. Meanwhile, revenues were down 26.7% from 12 months earlier to $957.3 million. Low prices have continued the trend of depressed natural gas revenues. The volume of sales increased across all market segments, including industrial (+3.8%), commercial (+3.0%) and residential (+0.5%) compared with the same month a year earlier. In October, total receipts of marketable gas in Alberta were up 5.7% to 9.0 billion cubic metres. At the same time, British Columbia posted a 3.1% decrease to 3.0 billion cubic metres. 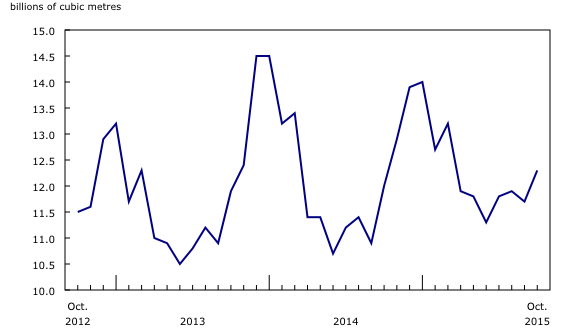 Most provinces posted lower revenues in October, largely attributable to sustained low natural gas prices. Revenues in Alberta were down 56.7% to $198.1 million, while in Ontario they were down 5.2% to $441.3 million. By province, Alberta (up 4.3% to 3.1 billion cubic metres) and British Columbia (up 18.1% to 464.6 million cubic metres) reported the two biggest changes in natural gas sales compared with October 2014. 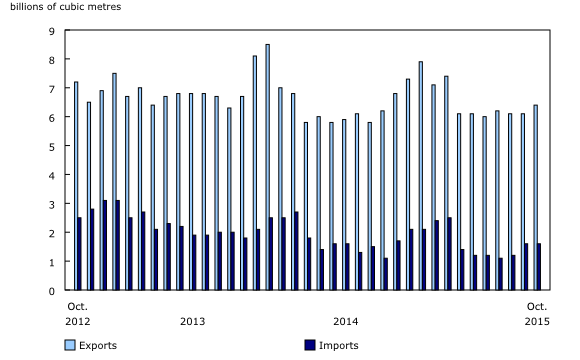 Canada's imports of natural gas by pipelines from the United States rose 47.3% to 1.6 billion cubic metres in October. Exports of natural gas to the United States rose 2.5% to 6.4 billion cubic metres. Data for September 2015 have been revised.